We come into the new week with some central bank event risk behind us that went off without a hitch, leaving markets in a state of anticipation, for whatever might be the next big catalyst to shake things up. Last week, both the ECB and Fed echoed their respective policy outlooks by way of the ECB decision and Fed Minutes respectively. The market has been confined to choppy trading conditions over the past several weeks. 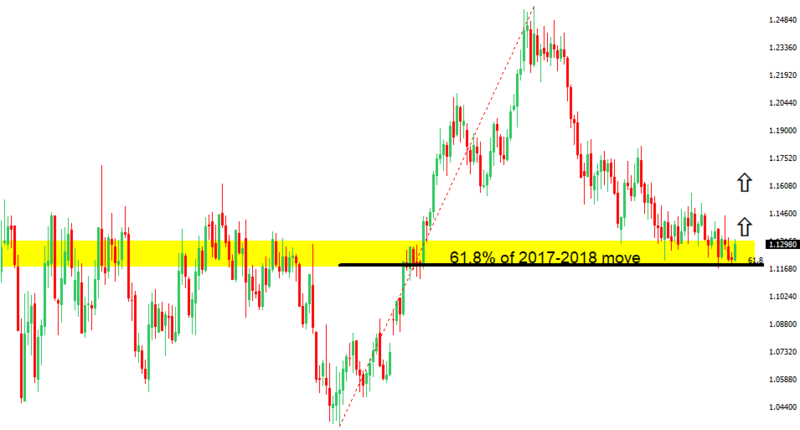 We are however coming off an intense round of setbacks since topping out at a +3 year high in 2018, with the drop taking the price back into an area that coincides with the 61.8% fib retrace off the 2017-2018 move, and a bullish breakout zone from 2017. This suggests additional setbacks could continue to be very well supported, with the greater risk from here, for the formation of a meaningful higher low, ahead of a push back to the topside. At this point, we will need to see setbacks holding up above 1.1100 on a weekly close basis, and a break back above the current 2019 high around 1.1570 to encourage this prospect. The ECB left rates unchanged as expected earlier this week, while reiterating that it saw rates at current levels until at least through the end of 2019. While there are plenty of downside risks to the Eurozone economy, it seems the ECB's overly accommodative policy stance has already done a good job accounting for this, all while the Fed policy outlook still shows room for further accommodative adjustment. Throw in tough talk on trade from a US administration designed to effectuate a weaker US Dollar, and that Euro demand on dips becomes easier to reconcile. We highlight exceptionally low volatility in the Euro at the moment, warning of a big move ahead. After seeing such a big move to the downside, it's also conceivable that the anticipated surge in volatility will coincide with a big move back to the topside. Looking at Monday's calendar, only US empire manufacturing data and some ECB Villeroy speak stands out. The major pair has put in an impressive recovery off the multi-month low in early January, helping to support the case for a longer-term developing uptrend off the 2016 low. Pullbacks are now viewed as corrective on the daily chart, with dips expected to be supported ahead of 1.2700. Look for a weekly close back above 1.3400 to strengthen the outlook. Brexit remains in a perpetual state of wait and see, after the UK was granted another six months to figure it out. But if anything has become clear throughout the saga, it's the fact that no one wants to see a disorderly Brexit outcome. 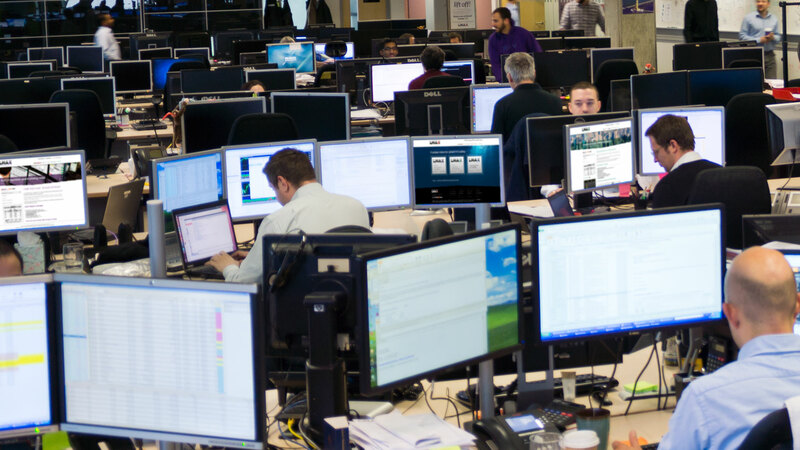 This has been a significant fact for the market to process, as it has resulted in some outperformance in the Pound in 2019, as those worst case fears have been priced out. Looking at today's calendar, things are light. US empire manufacturing data and some BOE Haskel speak are the only notable standouts. The major pair has run into resistance in the 112 area, after an impressive run off the 2019 flash crash low. 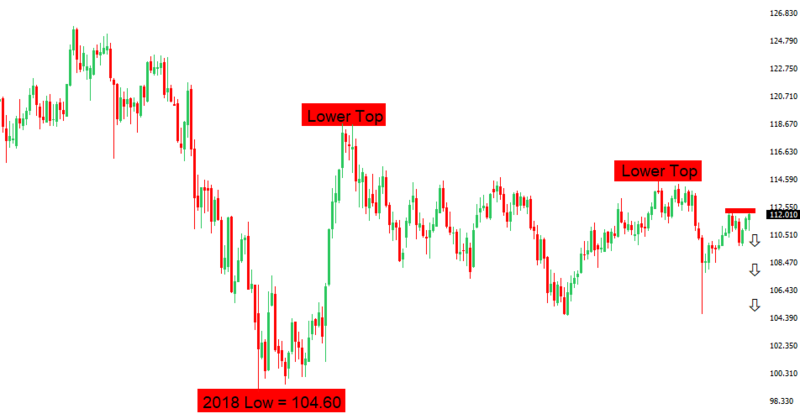 Look for this area to continue to cap rallies, setting the stage for the next major downside extension back towards that 2019 flash crash low, down in the 104.00s. Below 109.70 will strengthen the bearish outlook, while ultimately, only a daily close back above 112.15 would delay. Overall, the major pair should continue to place a bigger focus on global risk sentiment and US Dollar yield differentials. Updates on the US trade policy front are expected to have a major influence on direction as a consequence. US-Japan trade talks kick off this week and will be monitored. Ongoing demand for US equities has been a major prop for USDJPY over the past several days. Looking ahead, Monday's calendar is exceptionally thin, with only US empire manufacturing data standing out. A recent breakdown below 1.1200 was well supported, with the market holding up into what has proven to be a formidable base. At this stage, there is no clear trend, and it will take a sustained break back above 1.1500 or below 1.1200 for directional insight. The SNB remains uncomfortable with Franc appreciation and continues to remind the market it will need to be careful about any attempts at trying to force an appreciation in the currency. But the SNB will also need to be careful right now, as its strategy to weaken the Franc is facing headwinds from a less certain global outlook. Any signs of sustained risk liquidation in 2019, will likely invite a very large wave of demand for the Franc that will put the SNB in the more challenging position of needing to back up its talk with action, that ultimately, may not prove to be as effective as it once was, given where we're at in the monetary policy cycle. The market has been very well supported since breaking down in early January to multi-year lows. 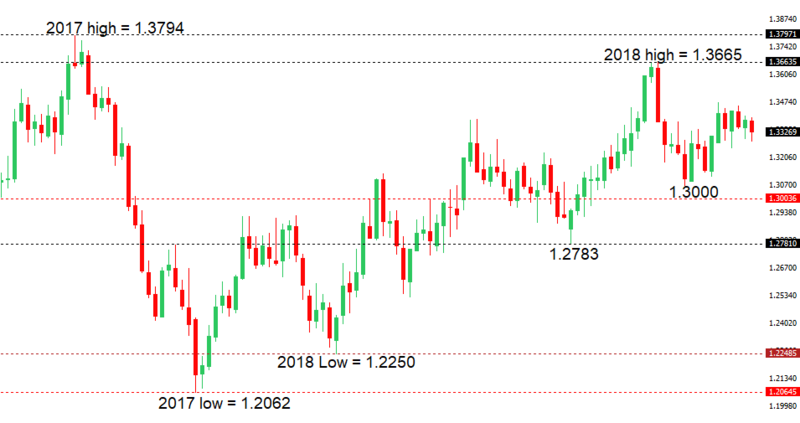 The price action suggests we could be seeing the formation of a major base, though it would take a clear break back above 0.7400 to strengthen this outlook. Look for setbacks to continue to be well supported ahead of 0.7000. Aussie has done a good job holding up into dips, getting a lot of help from the latest RBA decision in which the central bank held off from sounding overly dovish. Positive US-China trade talk updates, solid China economic data and bid equities have also helped to support Aussie. Australia will now be contending with a federal election, scheduled for May 18th. Monday's calendar is exceptionally thin, with only US empire manufacturing data standing out. Overall, the structure remains constructive, with dips expected to be well supported for fresh upside back above the 2018/multi-month high at 1.3665. Back below the psychological barrier at 1.3000 would be required to delay the outlook. The Canadian Dollar has seen a good amount of two way flow over the past several days. On the one side, it has benefitted from rallying OIL, solid Canada growth data, and the dovish shift in Fed policy. At the same time, the Loonie has been held up on ongoing uncertainty relating to US trade policy, and some softer economic economic data components. Looking ahead, Monday's calendar features the Bank of Canada business outlook survey and US empire manufacturing. While the bigger picture outlook still shows the market in a downtrend, as per the weekly chart, there's a case to be made for a meaningful low in place at 0.6425. As such, look for setbacks to be well supported ahead of 0.6500 in anticipation of additional upside, with only a break back below 0.6500 to put the focus back on the multi-month low from October at 0.6425. A push through 0.7000 will strengthen the constructive outlook. 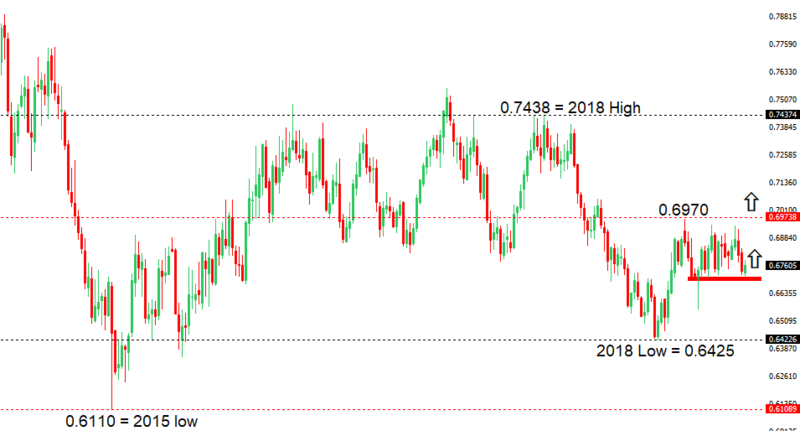 The New Zealand Dollar has done a good job holding up in the face of softer local data and a dovish shift in RBNZ policy, with the currency broadly supported in 2019 on rallying global equities and a dovish shift in Fed policy. Monday's calendar is exceptionally thin, with only US empire manufacturing data standing out. 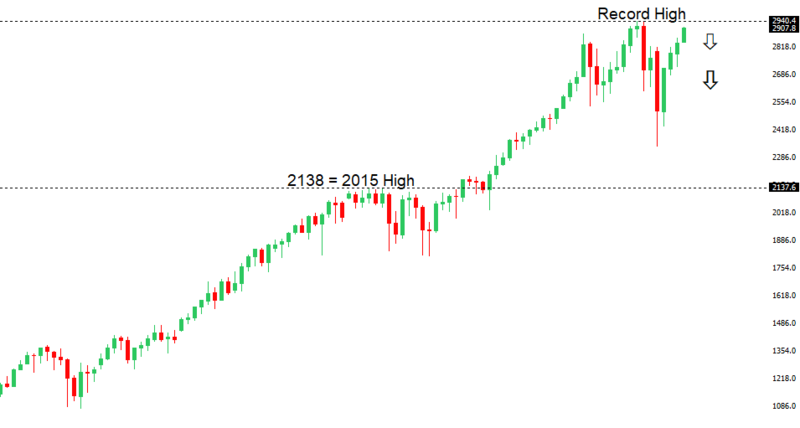 There have been legitimate signs of a major longer term top, with deeper setbacks projected in the months ahead. Any rallies should now continue to be very well capped, in favour of renewed weakness that targets an eventual retest of strong longer-term resistance turned support in the form of the 2015 high at 2140. 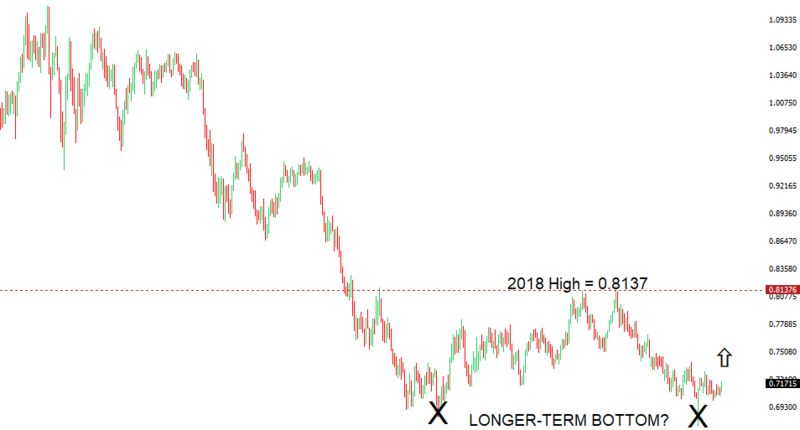 The projection is based off a measured move extension derived from the previous 2018 low from February to the record high move. Key support comes in at 2722, with a break to strengthen the outlook. 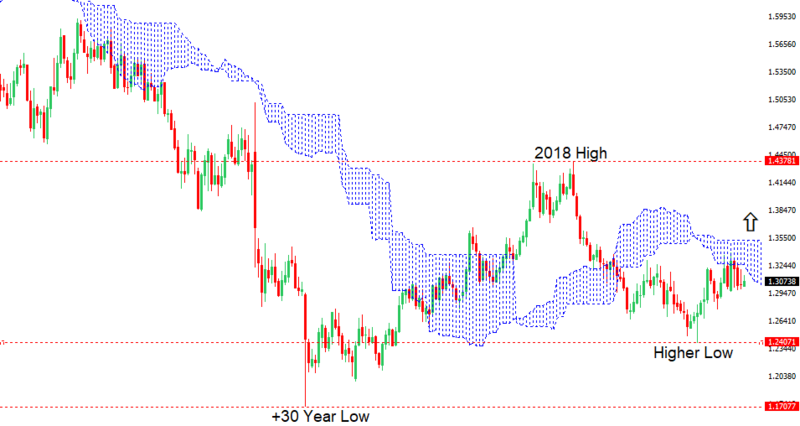 A break back above the record high from late 2018 would be required to delay the outlook. Although we've seen attempts to push the market higher in 2019, with the Fed's more cautious outlook keeping the market propped up, exhausted monetary policy tools post 2008 crisis suggest the prospect for fresh record highs at this point in the cycle are not realistic. We recommend keeping a much closer eye on the equities to ten year yield comparative going forward, as the movement here is something that could be a major stress to the financial markets looking out. 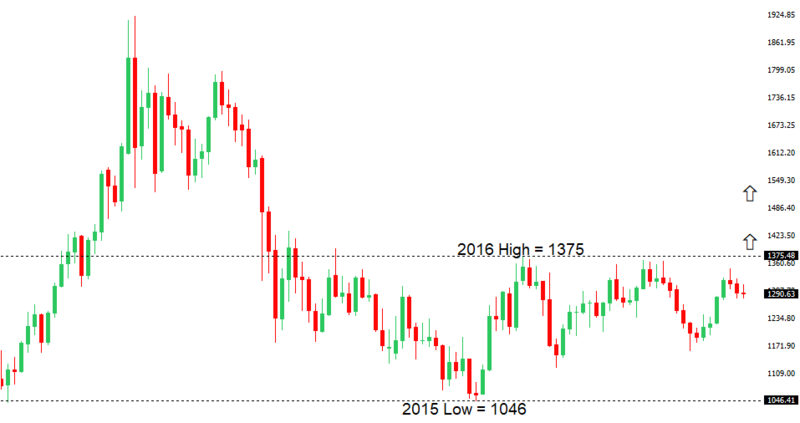 There are signs that we could be seeing the formation of a more significant medium to longer-term structural shift that would be confirmed if this latest recovery can extend back through big resistance in the form of the 2016 high at 1375. Look for setbacks to be well supported, with only a close back below 1250 to compromise the constructive outlook. 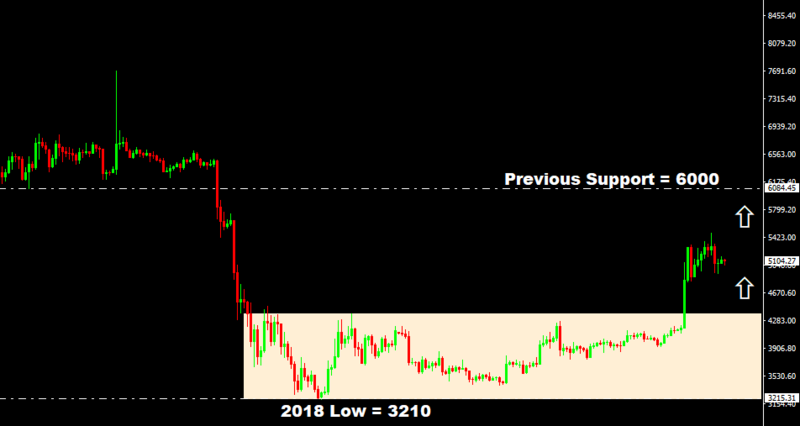 Bitcoin has broken out to the topside, after trading in a range since Q4 2018. 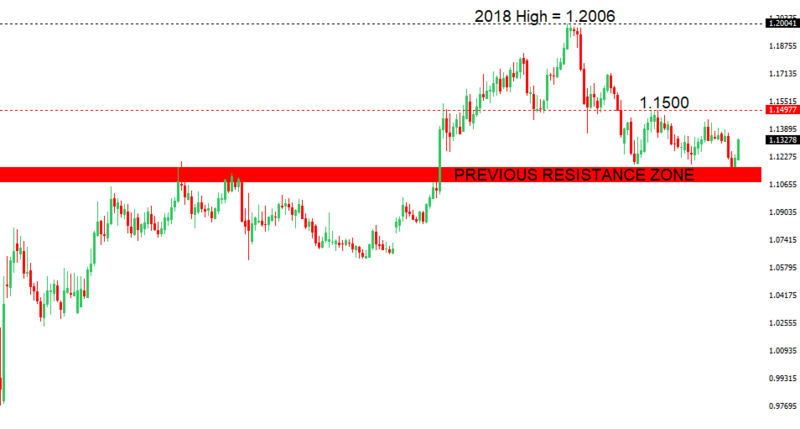 The break takes the immediate pressure off the downside and opens the door for a continuation of gains back into a critical previous support turned resistance zone in the $6,000 area. Look for setbacks to now be well supported ahead of $3,500. Bitcoin has finally broken back to the topside, above a consolidation high from back in December, to suggest it could be thinking about turning back up again in a more meaningful way. At a time when central banks have exhausted themselves with the unprecedented printing of money to keep sentiment running high and the global economy afloat, over a decade after the crisis of 2008, it would seem, a peer to peer decentralized currency, with limited supply, and an attractive technology that it rests on, could be a compelling alternative option. 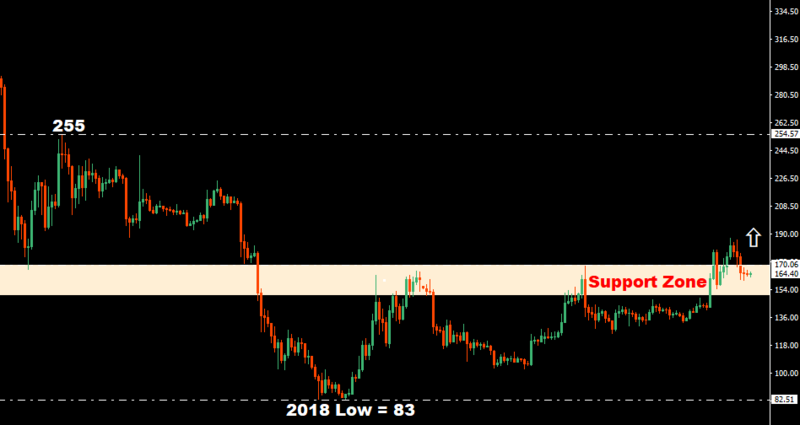 A recent push back above $170 takes the immediate pressure off the downside and opens the door for an upside extension towards the next critical level of resistance at $255. Look for setbacks to now be well supported ahead of $125, with only a break back below this level to compromise the outlook. Ongoing regulatory challenges and technological obstacles are some of those headwinds that are being fleshed out into 2019. Meanwhile, fear of broad based risk liquidation in global financial markets now that the monetary policy accommodation well has dried up, is yet another worry for the more risk correlated Ether. At the same time, longer term prospects are looking quite bright and valuations are increasingly attractive with adoption showing signs of ramping up over the longer term.